I scream, you scream, we all scream… Oreos! I baked an Oreos Chocolate Cake for a barbeque gathering with my colleagues using the simple and fuss-free Oreo Chocolate Cupcakes recipe. It’s exactly the same recipe, just that there’s much more Oreo goodness in it this time round. As I was photographing the cake… I was so tempted to keep the whole cake to myself and not bring it to the barbeque. But I thought of my waistline. I thought of my waistline and decided to share the calories and fat Oreo love. I baked this cake in the morning – took me 30 minutes to wait for the ingredients to come to room temperature, 20 minutes to measure and mix the ingredients (but because I took photos of the step-by-step I took a bit longer), 30 minutes to bake and then 1 hour plus for the cake to cool down. I made the frosting while the cake is baking and frost after the cake is fully cooled. It made it to the barbeque at night and was gone within several hours. Sift them into a large bowl. 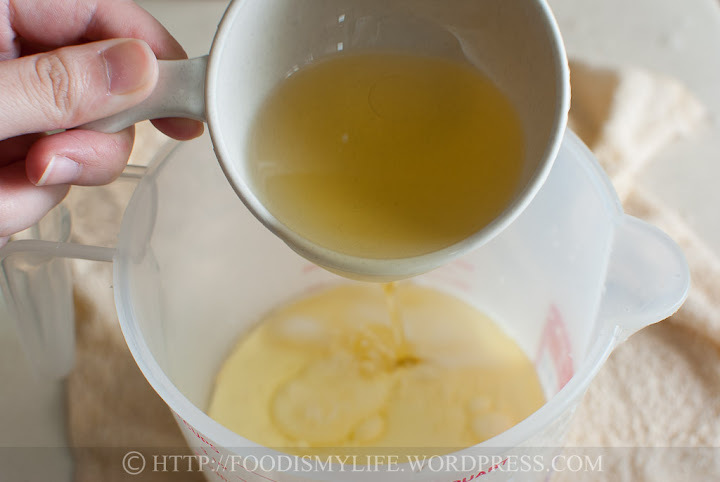 Add in sugar and whisk gently until mixed thoroughly. 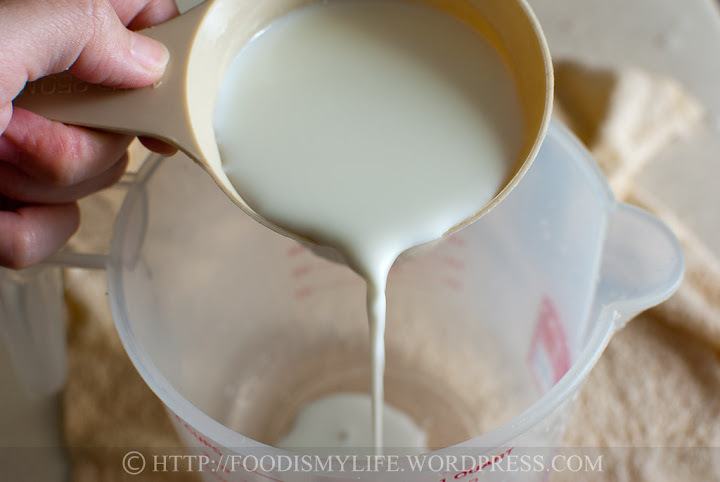 Pour into the dry ingredients and stir with a metal / wooden spoon. Add in hot water and stir. 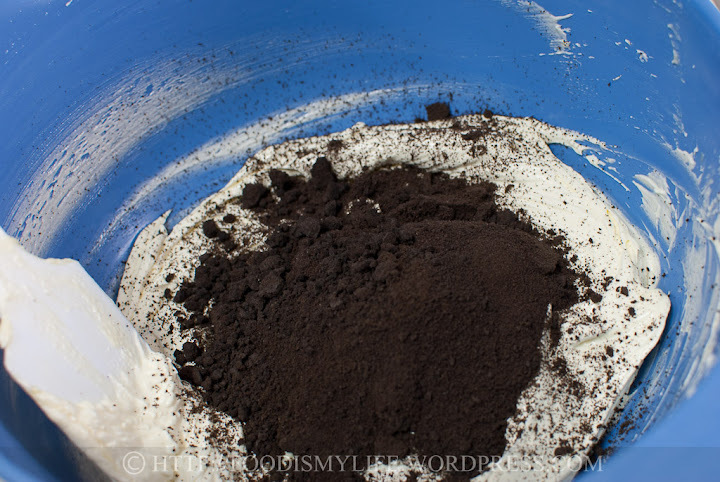 Dump in some plenty of crushed Oreos. Bake for about 30 minutes till cooked. 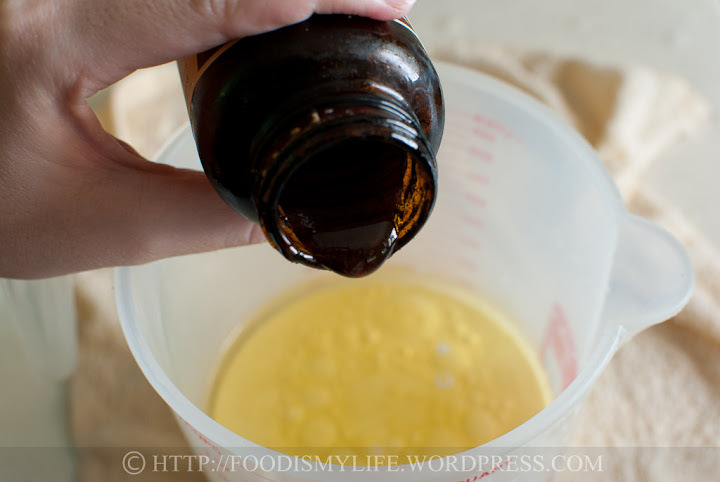 A splash of vanilla extract / paste (I am so loving my… oh oops I was on repeat mode). 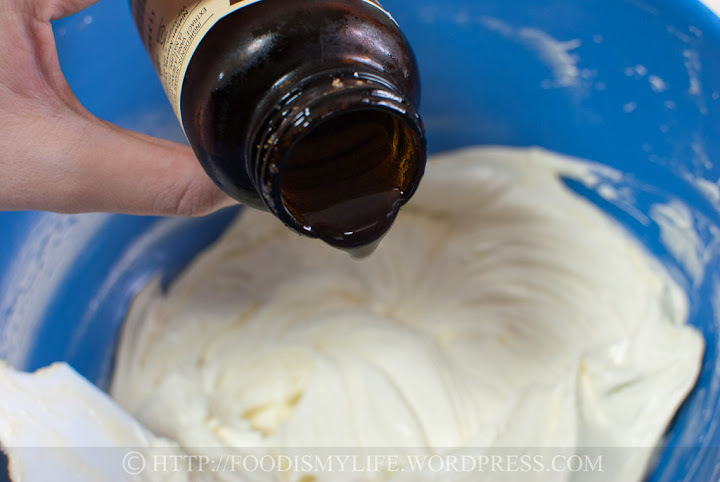 Dump the frosting on top and spread with a spatula. Or change your mind like me and remove the spread frosting, transfer it into a piping bag and pipe mini rosettes on top of the cake. I can’t stop at one slice… can you? Preheat the oven to 170 degrees Celsius. Butter one 8-inch square baking tin and line with baking paper, allowing the sides to extend out so that it will be easier to lift out later on. 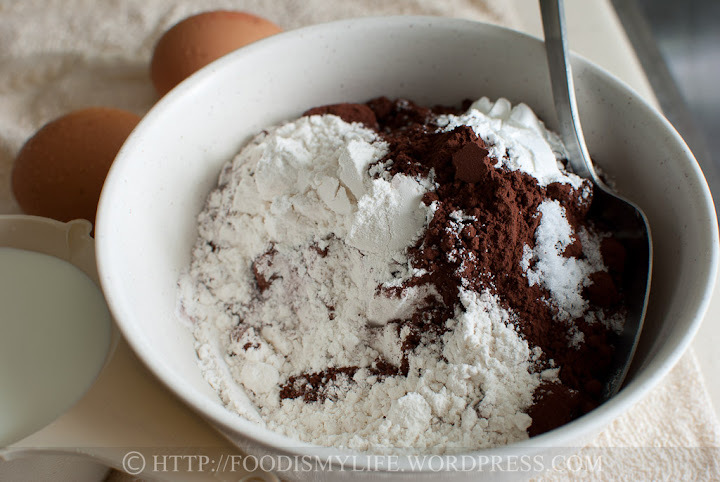 Add the eggs mixture into the flour mixture and stir together till they are all combined together (I find a wooden / metal spoon works best here). 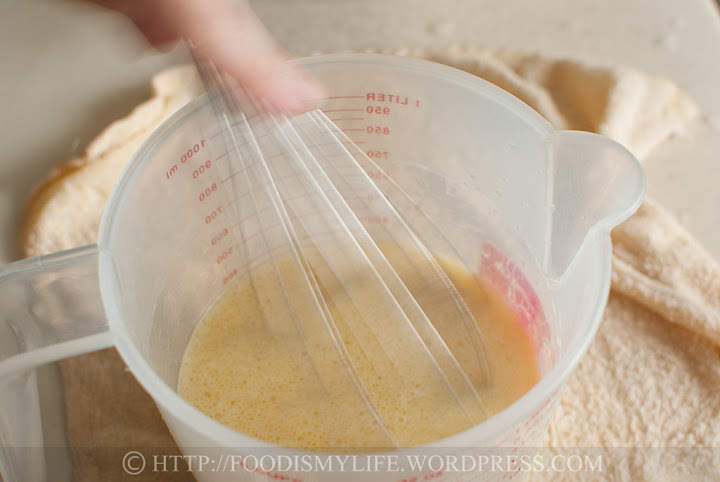 Add in the boiling hot water and mix together gently (here, I think a whisk works better). 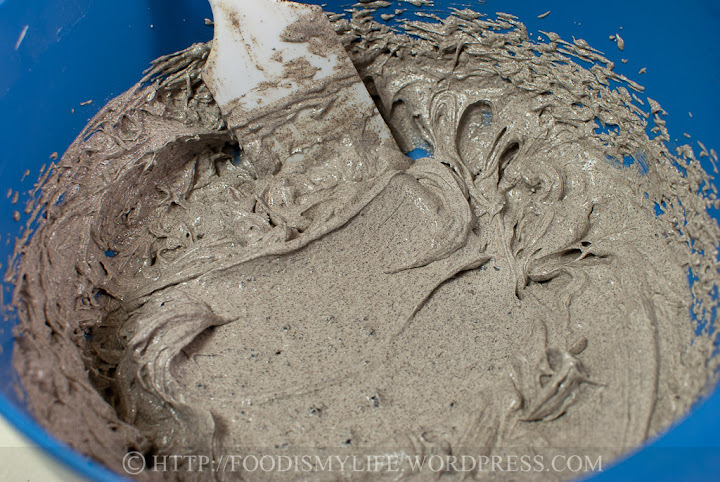 Stir in the Oreo chunks. 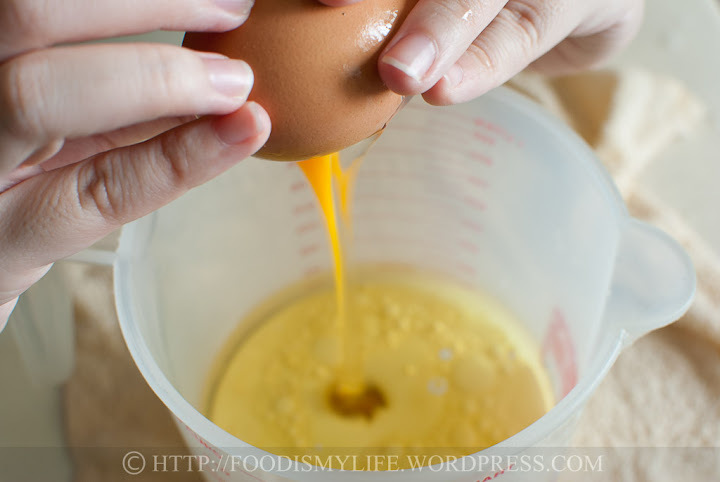 Transfer the batter into the tin and bake for 25 – 35 minutes until a skewer inserted into the centre of the cake comes out clean. Let the cake cool completely in the tin before frosting. 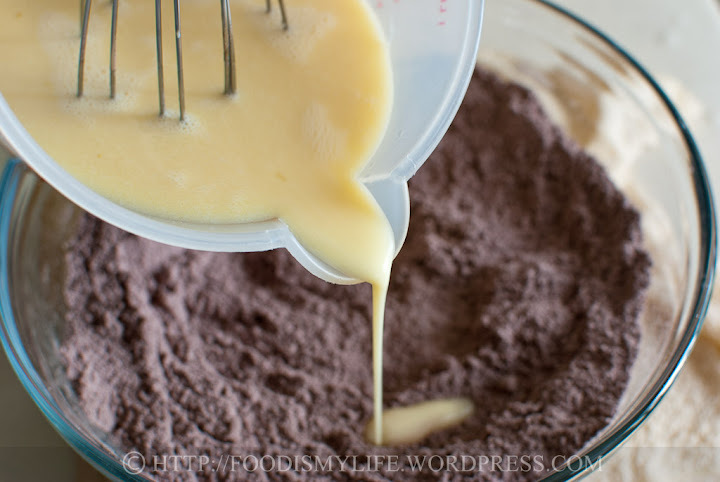 Using an electric mixer or food processor, beat the cream cheese, unsalted butter and icing sugar together until light and fluffy. 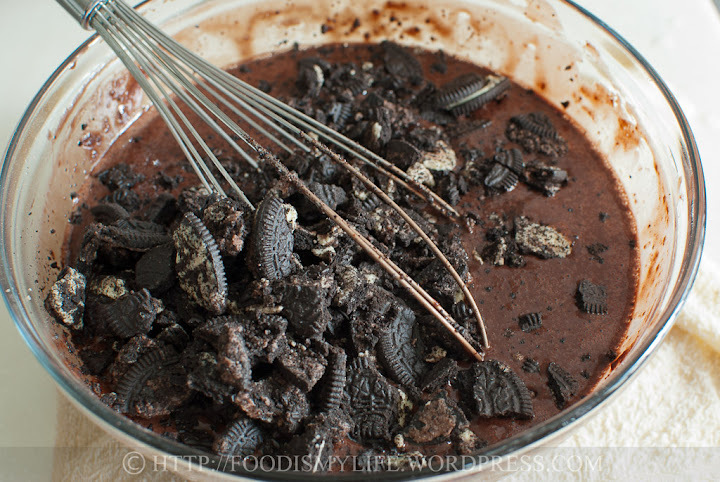 Beat in the vanilla extract and then the crushed Oreos. Spread the frosting on the cooled cake in the cake tin directly (or you can take it out then spread it like me). 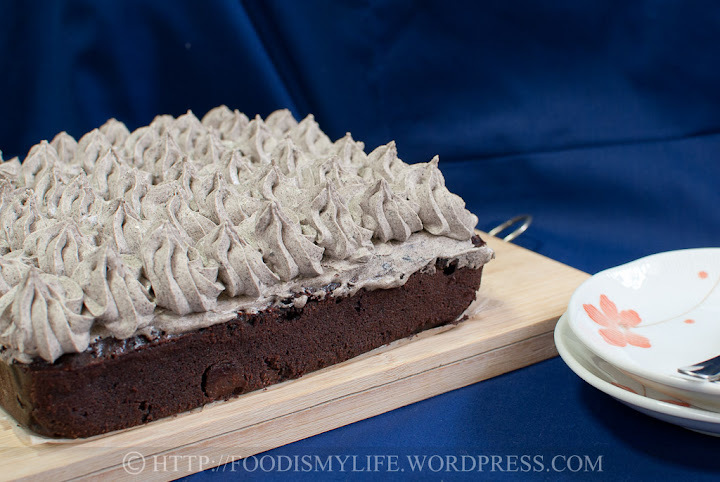 If you want a more decorative finish, transfer the frosting into a piping bag fitted with a star tip and pipe small rosettes all over the cake. 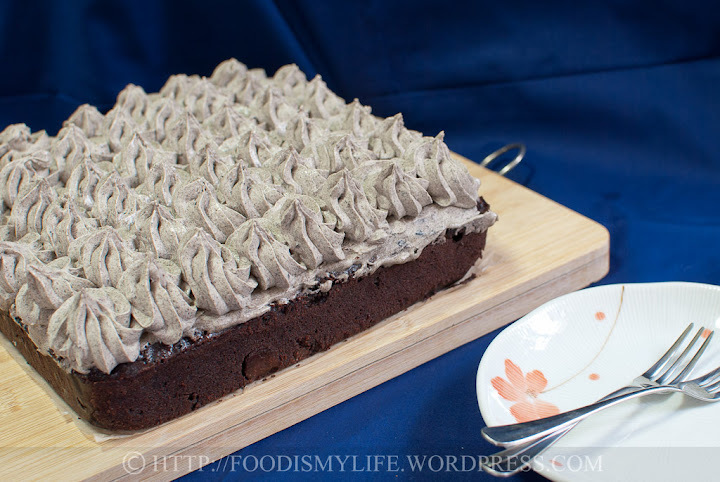 The cake is best serve slightly chilled so that the frosting is not too runny. 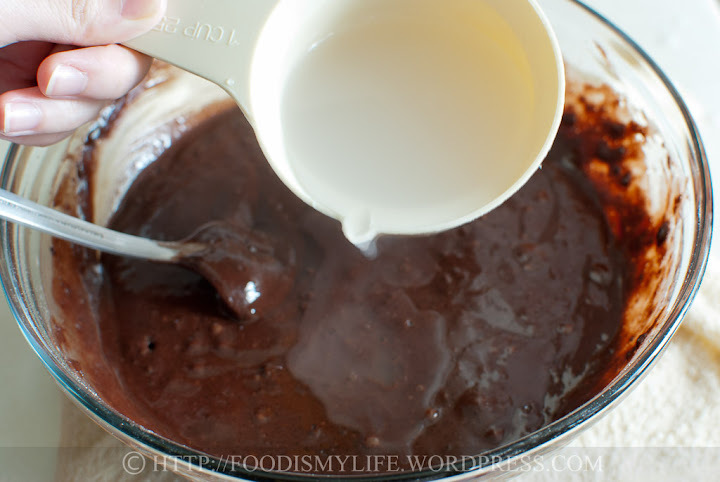 Serve it plain, with chocolate sauce or with a generous dust of Oreo crumbs. 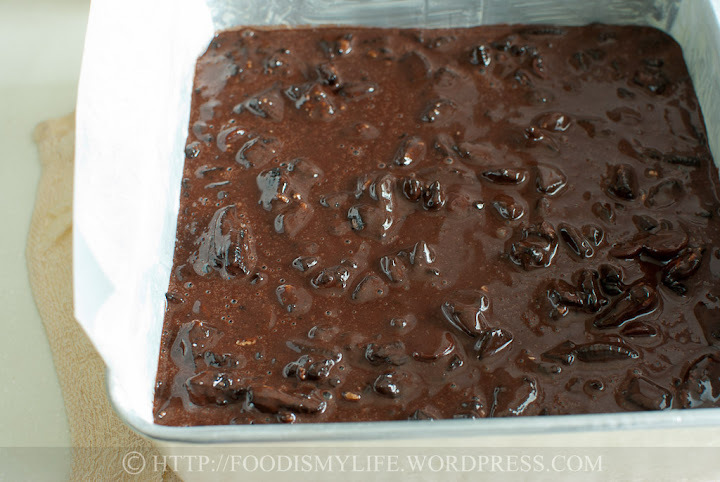 Unfrosted cake can be kept at room temperature in an air tight container in a cool place for 2 – 3 days. Store frosted cake in an air tight container in the refrigerator for 2 – 3 days (don’t keep it for too long as the cake will dry out in the fridge). 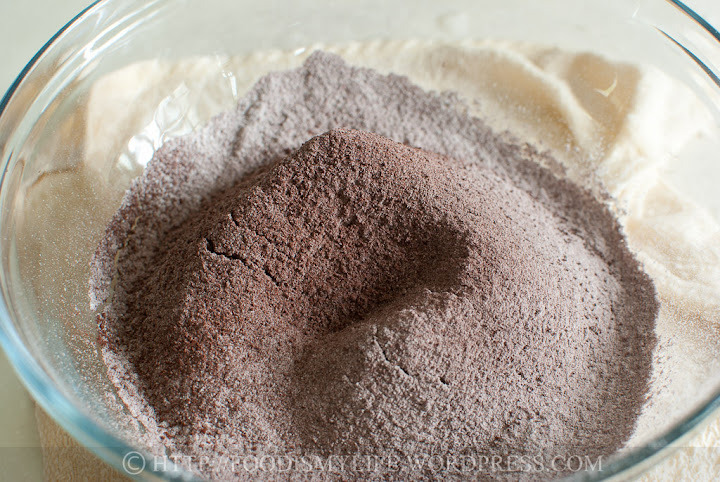 The cocoa powder I used is Hershey’s natural cocoa powder, which is acidic and will react with the baking soda. 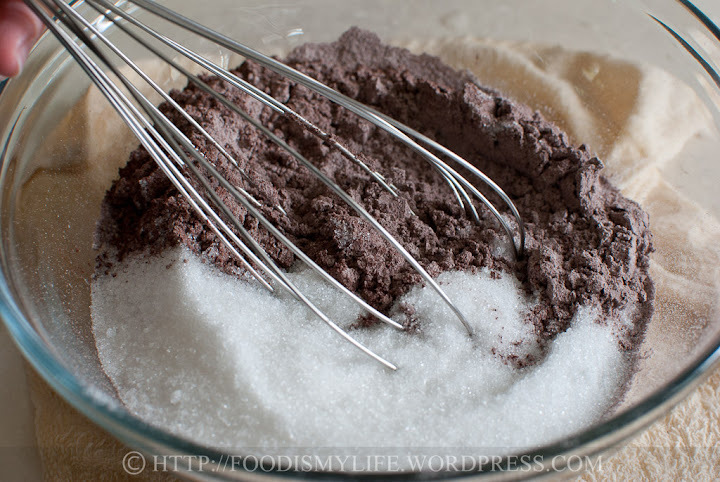 If using Dutch-processed cocoa powder, reduce baking soda to 1/2 teaspoon and up the baking powder to 1 teaspoon. 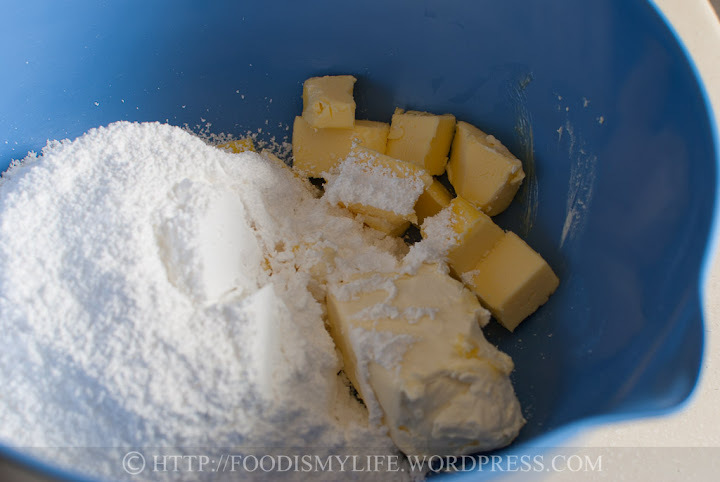 Use an all butter buttercream frosting – simply substitute the cream cheese with equal amounts of unsalted butter. If you don’t have a food processor like me, simply place the Oreos in a large ziploc bag. Use a rolling pin or a bottle, roll the biscuits until they are all crushed to desired size. You can also whack with the rolling pin but don’t whack it too hard as the ziploc bag may tear. I made it last night! It is amazing!!! 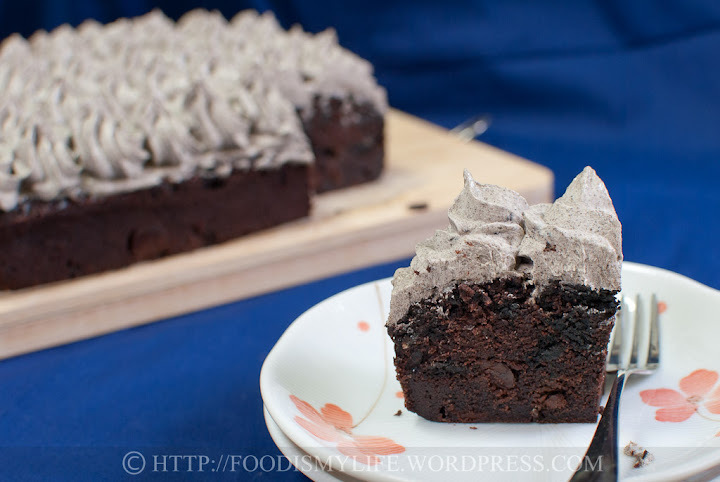 Very easy recipe and the cake is delicious!!! Hi Danielle, Singapore’s weather is very warm and humid, if I don’t keep it in the fridge, the frosting would soften too much and would probably spoil very easily. As for travel wise, it depends on how long you intend to bring the cake out. I kept the cake in the fridge before I brought it out to my friend’s BBQ. The cake was gone within 4 hours, but some of my friends said that they’d have liked it better if the frosting is colder and stiffer. Does the oreo frosting REALLY need to be refrigerated? How will do you think it will travel? Oh wow! This cakes looks so perfectly delicious! I have got to try this, I know my son would love it! Thank you! Hope you’ll enjoy baking it as much as I do! Thank you! Yes I can’t stop scooping and eating it by itself! Thanks Lena! 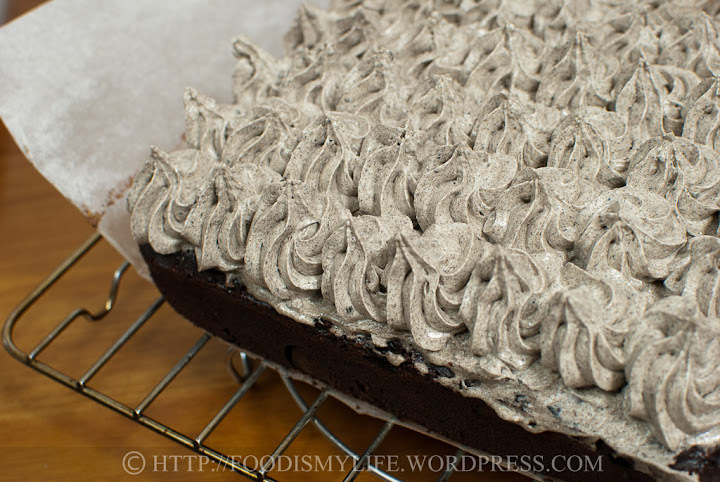 I’m not a fan of frostings, but this Oreo cream cheese frosting is unbelievably delicious, hope you give it a try soon! Yum! And such pretty presentation, too. gorgeous!! you want to hv the whole cake by yourself?? 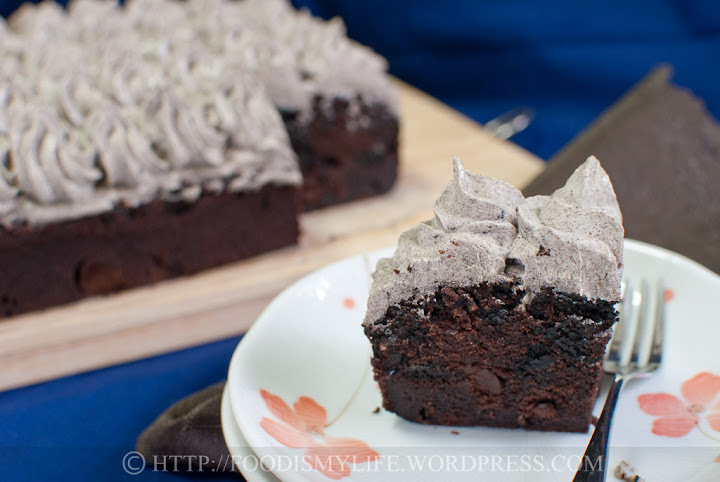 haha..i guess it’s also torturing me now seeing this cake of yours, that oreo frosting sounds heavenly!! That fluffy whipped topping gets me every time. It looks delicious! Chocolate’s one of my top favourites 😉 Thank you! Oh I agree, it is indeed an evil cake! 😉 I ate more than a slice myself *looks at waistline guiltily…* Glad you enjoyed the cake! Oh I really love that line Bobbi! I think I need to think of more cakes that I can bring for BBQ now! Have a great week ahead! You’re welcome Stephanie, hope you’ll like the cake! 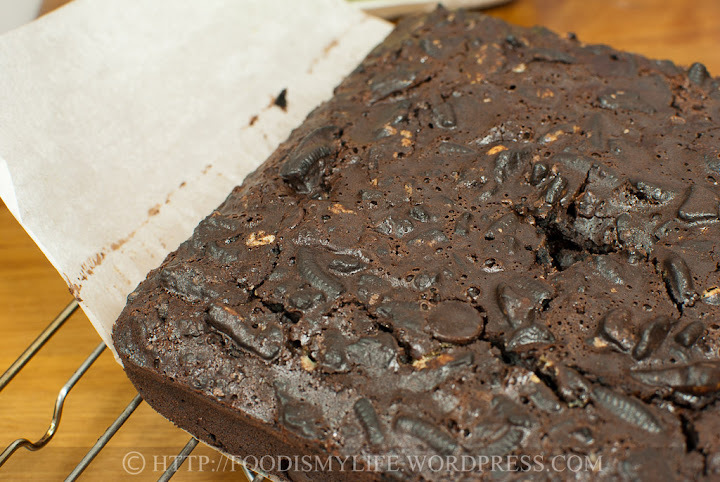 Oh my, I see you have a lot of chocolate-y goodness on your blog! This cake looks amazing!!! Wow another beautiful creation, I hope you were my neighbor so I can have those goodies just by knocking at your door. Well this cake is just evil in all of its chocolate goodness. Who could resist something so amazingly delicious! 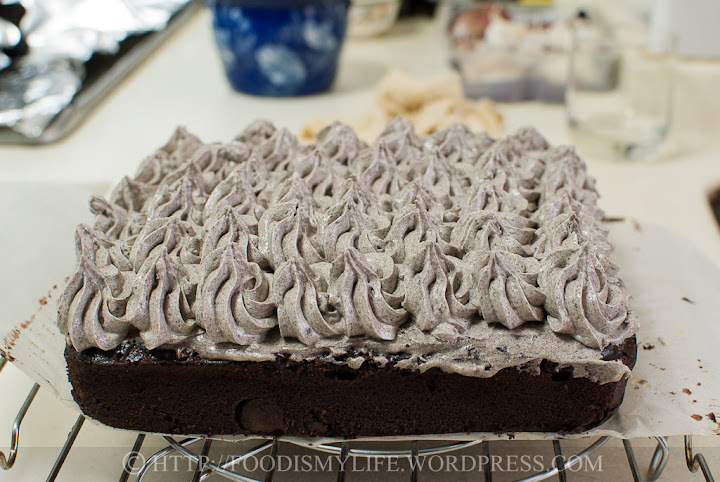 I love love love the chocolate flecks in the icing. Magical! You are just fantastic, what a delicious cake and your photo’s are so professional! This is beautiful, I am speechless!! the photos are gorgeous!! 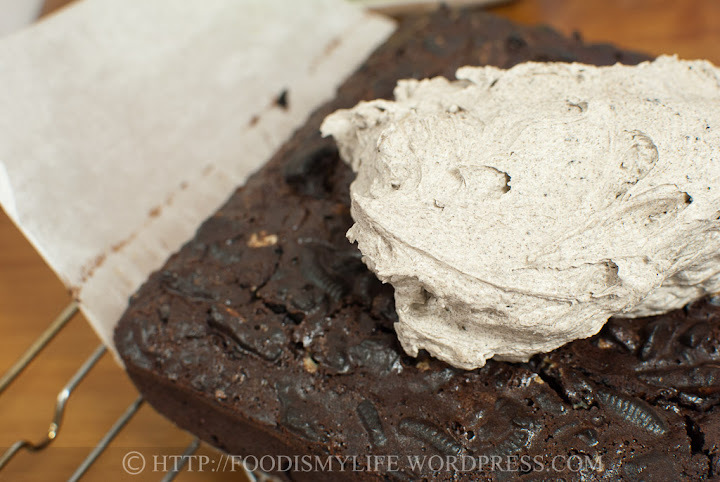 I was looking for a recipe exactly like this one to finally use up the box of oreos I’ve got here. Thanks!! Aww thank you Villy! Glad you like the cake! Thank you Marnelli! Oreos are super delicious and addictive! Thank you for the sweet compliments. Have a great week ahead! Oh Jasline, this is HEAVEN on a plate!! I am in love with a cake I’ve never eaten. I can’t wait to make this!! My oh my that looks so yummy! And, your photography is astonishing!